I decided to combine two reviews into one because these products go hand in hand in my opinion. I have been using Aveeno products for close to 6 years. Before that I struggled to find something that would keep my skin balanced. Wearing a hard hat all day long really didn't bode well for a clean t-zone! Aveeno worked for me and because it was branded as 'natural' I felt like I was using a good product. There are even leaves on the product so that has to mean it is made from nature RIGHT? WRONG!! A few months ago I thought I would branch out and change what I was using on my face. I replaced my Aveeno Foaming Cleanser with Kiss My Face Start Up Exfoliating Face Wash and gradually introduced it to my morning and evening routine. At first I was hella disappointed because it made me break out like a 16 year old. But I kept at it and after about 6 weeks it evened out and now my skin is better than ever. It feels clean and looks great. 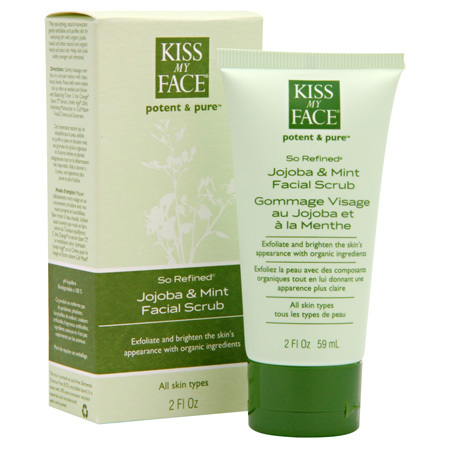 A month ago I finished up the last of my Aveeno exfoliating pads and switched to Kiss My Face So Refined Jojoba & Mint Facial Scrub. 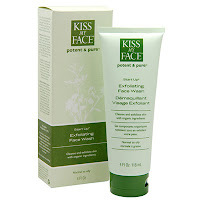 I use it once a week and it helps to keep my face fresh and renewed. Both of the Kiss My Face products are 100% biodegradable and contain no parabens, phthalates, SLS, artificial colours, artificial fragrances or animal ingredients. The boxes they come in are made from acid and elemental chlorine free board with 50% post consumer recycled materials. They are also made using wind power. I was not provided these products for review. I bought and paid for them myself and all opinions expressed are my own. This post contains affiliate links.